Medelec Switchgear Ltd. was founded in 1977 and started its primary operations as an assembly plant for distribution switchgear and transformers under licence from GEC of England. Since commencing operations, Medelec grew and expanded its activities, investing heavily in plant equipment, human resource development to become a leading key player in the North African market. Medelec has delivered an extensive range of products ranging from MV switchgear to compact substations, Control and Protection panels incorporating the latest digital technology for new or as replacements for existing substations. Medelec’s main office, design, development and production facilities are located in the Mediterranean country of Malta. Malta is well known for its strategic location in the heart of the Mediterranean being just 96km south of Sicily and 290km north of Africa, Malta has a long history of serving as a bridge between Europe and Africa. Throughout the years Medelec has continued to serve this tradition having successfully delivered numerous successful projects to North African countries such as Libya, Tunis, United Arab Emirates, Yemen and Jordan amongst others. Our mission is to deliver value to our clients by providing high-quality, reliable electrical power engineering solutions with a strong emphasis on service and customisation. Our commitment to the very best in quality, reliability and service will lead to continuous improvement in our products, services and processes as well as greater client satisfaction and confidence. This will allow us to become the provider of choice in the markets we operate in. We accomplish our work by considering every aspect involved, no matter how small. We act with integrity and respect in order to build trust and fulfil our promises to all our stakeholders. We make our clients and their specific needs a primary focus of our actions by developing and sustaining an attitude of service. We are proud to be Medelec. 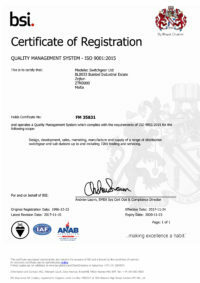 Medelec Switchgear has a complete Quality Management System (QMS), which complies with, and is certified to ISO 9001:2015. The company’s main objectives are to provide high-end, safe, reliable and cost effective solutions. This is achieved by modern quality procedures and manufacturing techniques applied within the company. Processes within the company are continuously monitored, measured and analysed. Actions are taken when results do not meet objectives providing a drive for continuous improvement. Medelec strives to enhance customer satisfaction by maintaining on-going initiatives to improve the quality and reliability of products. The delivery of defect free products and services on time is imperative. Medelec’s customer-minded engineers work closely with customers in order to provide customised and technical solutions. VMX – Medelec starts producing its first 11kV VMX vacuum insulated circuit breaker switchboard. This new switchboard could also provide extensions to the BVP 17 switchboard. HMX – Medelec starts producing it’s first 30kV switchboard. The switchboard’s vacuum interrupters are insulated in SF6 gas. Medelec opens a representative office in Tripoli whereby the staff assists in project monitoring and co-ordination of relative site commissioning work. Medelec celebrates 10 years in operation by hosting a Technology Transfer Seminar. Medelec establishes another joint venture company in Libya with the purpose of manufacturing some of its low voltage and medium voltage switchgear in Libya. Medelec Switchgear Ltd. will be exhibiting at the Middle East Electricity Fair in Dubai, UAE, between the 2nd and 5th of March 2015.